When you decide to start a blog, sometimes you want some of your blogpost to be available only to a select few. Only to people with the password! 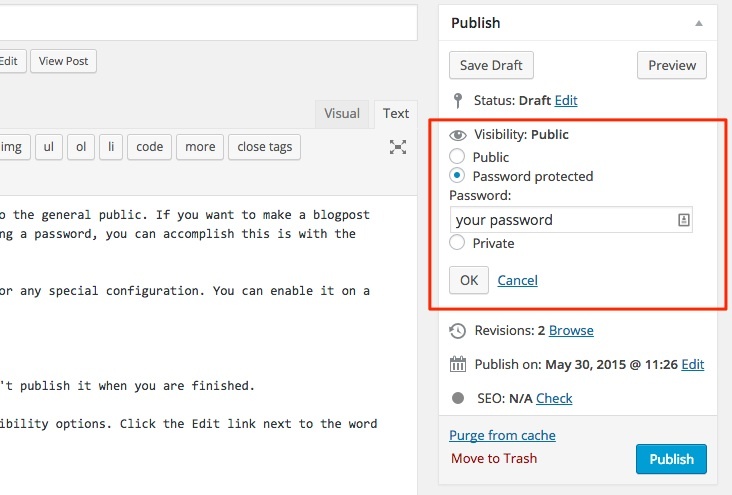 If you want to make a blogpost private so that a visitor can only read the blogpost after entering a password, you can accomplish this is with the Password Protected feature in WordPress. This is a built-in feature in WordPress, you don’t need a plugin or any special configuration. You can enable it on a post-by-post basis. It’s quite simple to do it, just follow this quick tutorial. This tutorial is also available for PDF download for free using the box below. 1. Write your blogpost like you would any other blogpost, but don’t click the publish button yet. 2. Above the Publish button, In the Publish box on the right of your blogpost, you have Visibility options. Click the Edit link next to the word Public this is highlighted with a small eye icon. 3. Click on the Password protected option and a new field will appear. You can enter a password into this field. You can then publish the blogpost. What Happens When you Password Protect a Blogpost? 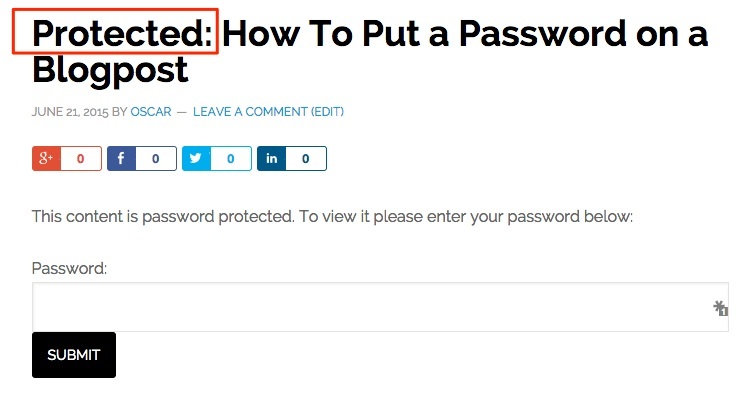 Keep in mind that if you use a password to lock down your blogpost, visitors can still read the title. Only the contents of the blogpost will be hidden. Even though the blogpost is locked with a password, you can still read the title. You must communicate the password to anybody that needs to read the blogpost, you can email it to them. The blogpost will remain password protected until you change this option. If you want to remove the password protected option then click the Edit link again and change the option to Public, then click Update or Publish to make the changes active.